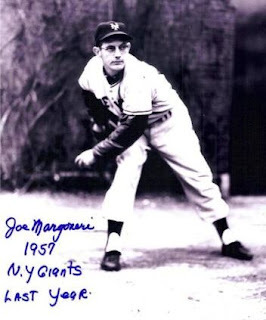 Joseph Emanuel Margoneri was born on January 13th, 1930 in Somerset, Pennsylvania. 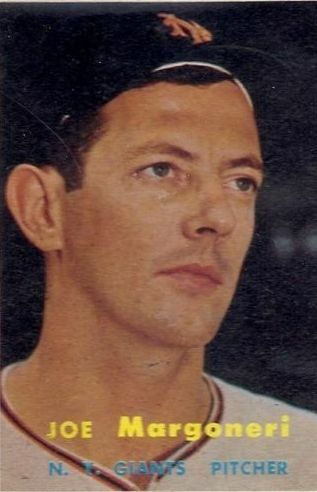 The six foot lefty was signed by the New York Giants in 1950. At age 20 he led the Wisconsin State League in wins (23) & strike outs (288) at Oshkosh. After another 18-8 season he went off to serve in the military during the Korean War. He returned to win 15 games (15-10) in 1954 in both AA & AAA at Minneapolis where he spent parts of the next three seasons. He was with the Giants at the start of the 1956 season debuting at the Polo Grounds against the Brooklyn Dodgers where he mopped up in a 7-2 loss. In his next outing he got his first career win against the Chicago Cubs at Wrigley Field. His ERA was a t 4.65 in early June when he was sent back to AAA Minneapolis, but returned to the Giants in mid July. In his return he gave up a walk off RBI single to the Reds Rocky Bridges. After another loss went into the starting rotation & he won four straight games, including a complete game five hitter against the Reds in New York. He then lost four straight before winning his last outing. On the year he was 6-6 with a 3.93 ERA in 23 appearances. The next year, 1957 the Giants last season in New York, he was 1-1 in 13 appearances as a left hander specialist, up until June 3rd but was sent back to the minors never to resurface in the major leagues again. In two seasons he was 7-7 with a 4.29 ERA striking out 67 batters walking 70 & allowing 13 HRs in 126 innings in 36 games. Retirement: From 1962 to 1991, Margoneri was in the corrugated paper business as a supervisor for the International Paper Company and the St. Regis Paper Company in Pittsburgh, PA. Then retired to West Newton, PA. Here's a recent interview with Margoneri, where he talks about how he became a New York Giant. Here is a recent interview with Margoneri where he talks about how he became a NY Giant.